Equally confident with small-and large-scale music, this player has excellent resolution and imaging and plays music with conviction. A slight lack of bass impact is its only weakness. Cyrus launched the CD 8 SE CD player just over a year ago and made great play of its 'Servo Evolution' transport mechanism. Justifiably so, indeed, for it is a considerable achievement for a company like Cyrus to come up with what is, in effect, a fully custom disc-reading system. Granted, many of the component parts are standard stuff, but Cyrus has done some clever low-level engineering and optimised the transport for high-quality audio duty. The result, the company claims, is more accurate reading of decent-quality discs: one assumes that some other parameters not so important for high-quality audio, such as jog-resistance or reading of damaged discs, have been slightly compromised, though if so it's not obvious from our experiences. 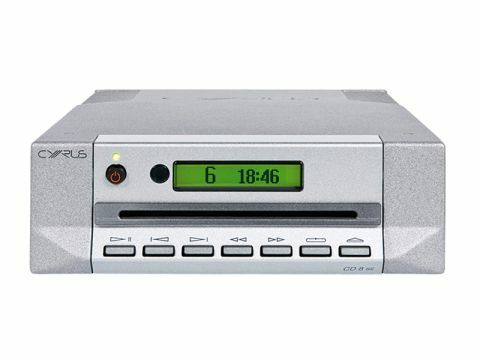 Given that most CD players seem to get bit-perfect readings off most discs one might query the importance of this devotion but, of course, the key results will be in the listening Audio circuitry is apparently pretty much unchanged from the original CD8 and the most obvious difference is that the CD8SE is a slot-loading player. Slot-loaders gained a dodgy reputation based on their early application in cheap in-car players and so on, but there's nothing wrong with them as a breed. This one is a little slow and doesn't quite eject the disc far enough for easy removal, but we've no real quibbles. The slot mechanism does take up a little less space in the case than the old tray one, but Cyrus has still had to be cunning to get the circuit boards in – they are, in fact, stacked, facing in opposite directions. As one would hope, there are high-specification electronic components in evidence and the familiar power supply arrangements using two small toroidal transformers, one for control and motor supply and one for digital and analogue audio circuits. Twin analogue outputs are provided as well as both flavours of digital, and there's also scope for upgrading with a PSX-R power supply. Although there was the odd discordant note sounded about this player's performance, on the whole our listeners found it enjoyable, informative and generally most engaging. It is particularly good at creating large and stable images and that, coupled with its good detail resolution, makes it very good at reproducing large-scale music. It is also good with small groups of performers, though, and scored a notable success with solo piano where its sound was described as full but also quick, with a solid image and natural tonality. In the Otis Redding track, the band was very clear and tonally consistent around the nicely defined vocal centrepiece and the music was felt very compelling and engaging. There is evidently plenty of bass volume and body, and it's tuneful and well-defined too, but the rhythmic impetus it imparts is not always quite the utmost. Under some circumstances this could be a serious drawback, but our listeners felt the effect was quite mild and largely compensated for by the detailed and lively midrange. For some reason, not a single comment came from the listening panel about the CD8SE's treble. Our subsequent sighted listening suggested that the simple reason for this is that it's very well balanced and integrated with the rest of the band – unfussy, in a word. It has very natural decay and, perhaps, just a shade less sparkle than some, but is never less than convincing, like most of the player's performance.